Back in August we heard that unofficial users of the tool were enjoying successes loading Android apps on Windows Phones without too much difficulty - and without any app developer help being required to alter code. The way it work sounded like an emulator was running. However apps that made use of Google Play Services often caused numerous issues in their practical use. Now it looks like Microsoft has had a rethink about the Windows Bridge for Android tool and it is no longer in development, reports Re/Code. The tech news site got in touch with Microsoft about this matter but Redmond wouldn't be drawn on whether it was delaying, putting on hold, or cancelling development of the Android-to-Windows tool. In a statement to Re/Code Microsoft said simply that the 'Astoria bridge' is not yet ready. Microsoft suggested developers look at its other tools for Web (Westminster) and iOS (Islandwood) developers which it has now made ready. It also mentioned another option coming soon; to allow the use of older Windows programs (Win32) to run on phones and tablets (a project called Centennial). "We're committed to offering developers many options to bring their apps to the Windows Platform," insisted the firm. Perhaps having the vast Android app library available but running with glitches on Windows mobiles, didn't seem such an attractive goal, as the tool got nearer to completion. 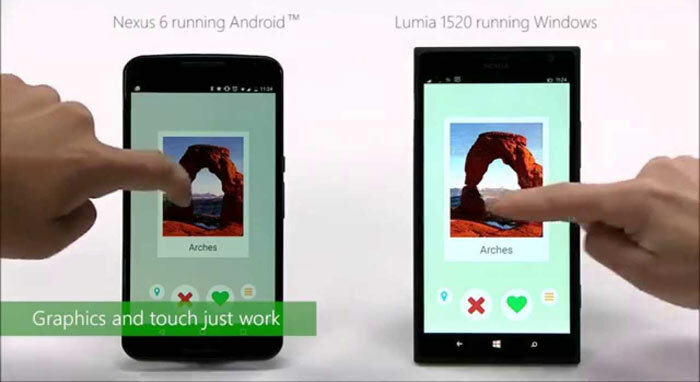 Such apps would surely show Windows mobile in a bad light. I currently have both Windows and Android smartphones and think that there are all the apps I want on Windows but they could be improved by offering feature parity with the Android ones. Overall I find the Windows mobile UI faster and more efficient for most tasks but the apps usually have less comprehensive options. Looking further ahead, Windows 10 and its universal apps might win more developer support as Microsoft heads towards its billion devices goal. This might be a better, higher quality option for Windows mobile apps going forward. I imagine this is less of a technical problem and more of a legal one. I can imagine Google saying they can't use anything that works via Google Play (i.e.. virtually all popular Android apps,) without a hefty licencing fee. Or possibly not at all. Don't even… now I'm over-excited.